Do you ever think about your parents getting older and not being able to remain in their home? It’s a difficult situation most of us will face in our lifetimes. Having an aging parent move into your home is one solution to that can be a wonderful experience. But, it also poses some obstacles you’ll most likely need to overcome. 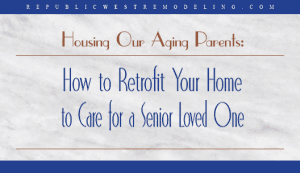 To address this complex decision, Republic West Remodeling has developed a new white paper that deals with accommodating a senior in your home. We discuss the issues you must address so the living arrangement can work well for every member of the household. In our white paper, we raise the issues involved in having an aging parent live with you. We also discuss how remodeling your home to include multi-generational features is a smart decision even if an aging loved one never moves in.